Glasgowmusic.co.uk - Review : "The Dandy Warhols - Old Fruitmarket - 30/01/19"
"Portland cult heroes The Dandy Warhols come to Glasgow for a 25th anniversary party." 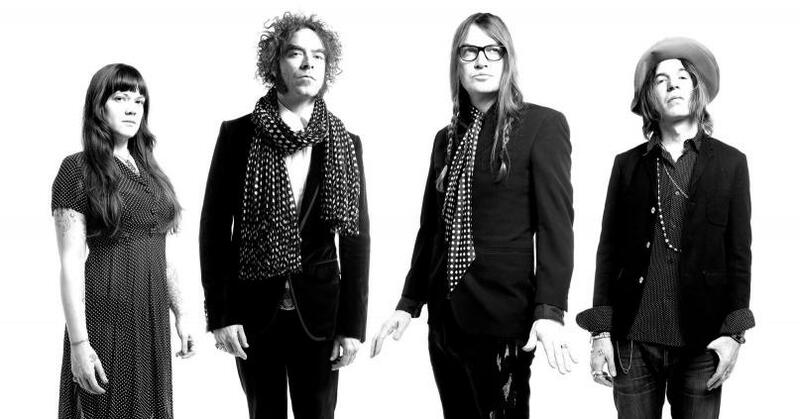 On the back of the release of their tenth studio album ‘Why You So Crazy?’, Portland indie stalwarts The Dandy Warhols return to Glasgow for a special twenty-fifth anniversary show. For a band who are known primarily for their big hits being used in adverts or games, they have never shied away from pushing the boundaries and keeping their music progressive and genre-defying. While there may be have been some raised eyebrows at the Dandies being booked for a festival like Celtic Connections, with a reputation as an intriguing live band, they without doubt fit the festival’s criteria on providing a diverse programme. The Dandys slink onto the stage without any fanfare and frontman Courtney Taylor-Taylor launches into the scuzzy riff of ‘Forever’. The four-piece are lined in a row across the stage, with no egotistic frontman hogging the limelight and the whole band ooze a swaggering cool, even if they are hidden behind atmospheric lighting, which drapes over them for most of the show. The classic glam stomp of ‘We Used to Be Friends’ and an infectious ‘Get Off’ are knocked out early doors, with Taylor-Taylor’s vocal hidden behind a mass of distortion. For most other bands, showing such contempt for their biggest singles would be off-putting, however in this case, the tracks lose none of their spark and continue to sound as fresh as ever. Judging by the rapturous reception they receive; the Glasgow crowd concur. It’s easy to forget just how influential and eclectic The Dandy Warhols are, and how most of the modern stoner-indie poseurs have stolen all their moves. ‘STYGGO’ contains the type of melodic, infectious chorus that Kurt Vile dreams of, and they even throw in a barroom-style hoedown in ‘Highlife’, with keys player Zia McCabe taking lead vocal duties, just because they can. The momentum is briefly lost with a bland ‘Small Town Girls’, but is quickly picked up again with ‘Motor City Steel’, a trippy country-inspired romp, and the highlight from the new record. The band themselves lose the rock star mystique, and for the first time look like they’re having fun, and who could blame them when performing a track as infectious as this. It wouldn’t be a Dandy Warhols show without a little self-indulgence, but this doesn’t come until they’ve knocked out ‘I Love You’, which unravels from a groovy strut into a post-rock droning squeal. ‘And Then I Dreamt of Yes’ continues in a similar vein, but keeps itself interesting with an excellent solo from lead guitarist Peter Holmström. A double header of favourites ‘Godless’ and ‘All the Money Or The Simple Life Honey’ get the crowd back onside, and even more so when they indulge in the repeated requests for an impromptu ‘Hard On For Jesus’ which is performed with an energetic vigour. Bands with one massive track like ‘Bohemian Like You’ tend to disown them fairly quickly, however the Dandys tonight deliver it with precision, and do not let down the crowd who have immediately launched their smartphones in the air to capture the moment as they go absolutely berserk. If there was any doubt that tonight was a celebration, twenty fifth birthday balloons adorn the side of the stage, and balloons are also dropped to the crowd as ‘Every Day Should Be A Holiday’ begins (with a false start, for good measure). As a cacophonous ‘Boys Better’ closes the set, the band leave amid a wall of distortion to a rapturous reception, it shows that even after twenty-five years of doing exactly what they feel like, as wildly diverse as it comes, the Dandys Rule OK.
Photo gallery of the gig is in the link below, photos courtesy of Stewart Fullerton Photography. This review has been viewed 811 times.